Animated comedy adventure sequel directed by Josh Cooley. The story follows Woody (Tom Hanks), and the rest of the toys, who welcome new friends to Bonnie’s room, including a reluctant new toy called Forky (Tony Hale). We follow Woody, alongside his old and new friends, as they go on a road trip adventure, where Woody is reunited with an unexpected old friend. Woody: Everyone, we’re going on a road trip. Woody: And Bonnie had a great day in class. She made a new friend. Woody: Everyone, Bonnie made a friend in class. Dolly: Oh, she’s already making friends. Woody: No, no. She literally made a new friend. I want you to meet Forky. Mr. Pricklepants: He’s a spork. Woody: Yes. Yeah, I know. Woody: Forky is the most important toy to Bonnie right now. we all have to make sure nothing happens to him. Buzz Lightyear: Woody, we have a situation. Forky: I don’t belong here! Aaah! Forky: I’m not a toy! I’m litter! Aaah! Woody: Oh, no. Hey, hey, somebody get him before he poke an eye out. Forky: I am not a toy. I was made for soup, salad, maybe chili, and then the trash. Woody: Buzz, we got to get Forky. Woody: You’re Bonnie’s toy. You are going to help create happy memories that will last for the rest of her life. Forky: Why do I have to be a toy? Woody: You have to understand, how lucky you are to belong to a child. Gabby Gabby: Hi, there. My name is Gabby Gabby. Gabby Gabby: Yes, you can. Boys. Don’t let Woody leave. Woody: Bo, what are you doing here? Bo Peep: No time to explain. Come with me. Woody: We need to get back to our kid. Bo Peep: Oh, Sheriff Woody, you’re always coming to the rescue. Bo Peep: Woody, who needs a kid’s room, when you can have all of this? Forky: Woody, aren’t we going to Bonnie? Woody: We got to get home, Forky! Jessie: We have to find them! Hamm: Jump out of a moving vehicle. Hamm: You got to go, you got to go. Woody: Wow, this place is amazing. Bo Peep: Wasn’t Buzz going to meet us here? Woody: He must be held up somewhere. Buzz Lightyear: Blast. How am I going to find Woody? Man: Kids, step right up. Get yourself a real Buzz Lightyear. Ducky: Hey, up here, Astro boy. Bunny: If you think you can take our top prize spots, you’re wrong! Buzz Lightyear: Help me get out of here. Ducky: Oh, I’ll help you. With my foot! Ducky: How you like that, cheetah? Oh, oh, to infinity and my foot! Boom! Ducky: [in pain] Aaah! Let go of me! Woody: You know, you’ve handled this lost toy life better than I could. Woody: You can’t teach this old toy new tricks. Bo Peep: You’d be surprised. Bo Peep: [to Woody] Kids lose their toys every day. Woody: I was made to help a child. I don’t remember it being this hard. 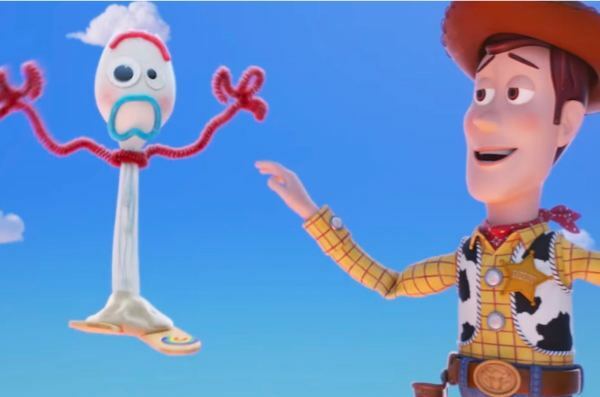 Forky: Woody, somebody’s whispering in your ear. Forky: Everything is going to be okay. What do you think of Toy Story 4 quotes? Let us know what you think in the comments below as we’d love to know.